Beyond Nuclear - Wall Street - Nuclear Relapse? Canceled! Nuclear power? Game over! Nuclear Relapse? Canceled! Nuclear power? Game over! Peter BradfordWall Street turned its back on investing in nuclear power before the 1979 Three Mile Island meltdown, and will not invest again -- unless all financial risks are shifted to taxpayers and/or ratepayers -- explains Peter Bradford in the Bulletin of Atomic Scientists. As reported by ScienceDaily in an article entitled "U.S. May Face Inevitable Nuclear Power Exit," the Bulletin of Atomic Scientists (BAS) has concluded its three part "Nuclear Exit" series with a look at the United States. The previous two installments examined the nuclear power phase-out in Germany, and the nuclear power status quo in France. The BAS U.S. coverage features former U.S. Nuclear Regulatory Commission Commissioner, Union of Concerned Scientists board member, and Vermont Law School professor Peter Bradford's "How to close the U.S. nuclear industry: Do nothing," which concludes that, without massive taxpayer or ratepayer infusions, almost all proposed new reactors will not happen, and currently operating reactors will permanently shutdown by mid-century, unless the NRC rubber-stamps 80 years of operations (as opposed to the current, already risky 60). 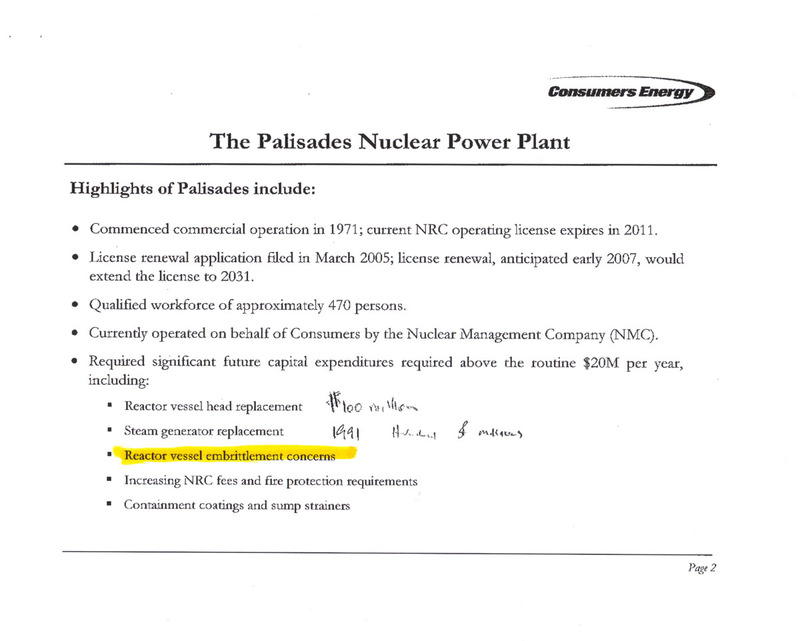 Bradford points out that "By this standard, units at Crystal River and San Onofre--currently closed by major equipment failures--appear to be serious shutdown candidates, though they may survive, because they are located in Florida and California, respectively, states in which regulators can override market verdicts and impose their repair costs on customers." In fact, Duke/Progress has thrown in the towel on Crystal River, announcing that it is now permanently shutdown. And Friends of the Earth, along with a groundswell of grassroots anti-nuclear activism in southern California, is doing all it can to keep San Onofre Units 2 and 3 shutdown for good, as well. A spokesman for Dominion Nuclear admitted that the "purely economic reasons" which led to the utility's decison to close its Kewaunee atomic reactor on the Lake Michigan shoreline in Wisconsin -- the first atomic reactor shutdown announcement in 15 years in the U.S. -- was the inability to make needed, major safety repairs andturn a profit, given the competitive electricity market. And Entergy Nuclear's brand new CEO, Leo Denault, admitted to Reuters that numerous of his "dirty dozen" atomic reactors -- especially the merchant plants (those in deregulated, competitive electricity markets) -- face tough economic challenges, due to costly upkeep (a.k.a., essential safety-significant repairs and component replacements). At its Palisades atomic reactor on the Lake Michigan shore in southwest Michigan, Entergy has chosen to foregonumerous major, needed repairs (such as replacing the badly corroded reactor lid; replacing the deteriorated steam generators, for the second time in the plant's history; dealing with the worst embrittled reactor pressure vessel in the U.S.; making needed fire protection upgrades, etc.) for six long years now, apparently in order to "balance the books" -- that is, to prioritize profits (and executive salaries, and shareholder returns) over public safety.